The Futuro is instantly recognizable with its art-deco style handles and wide curvy base that is just asking for a roast. 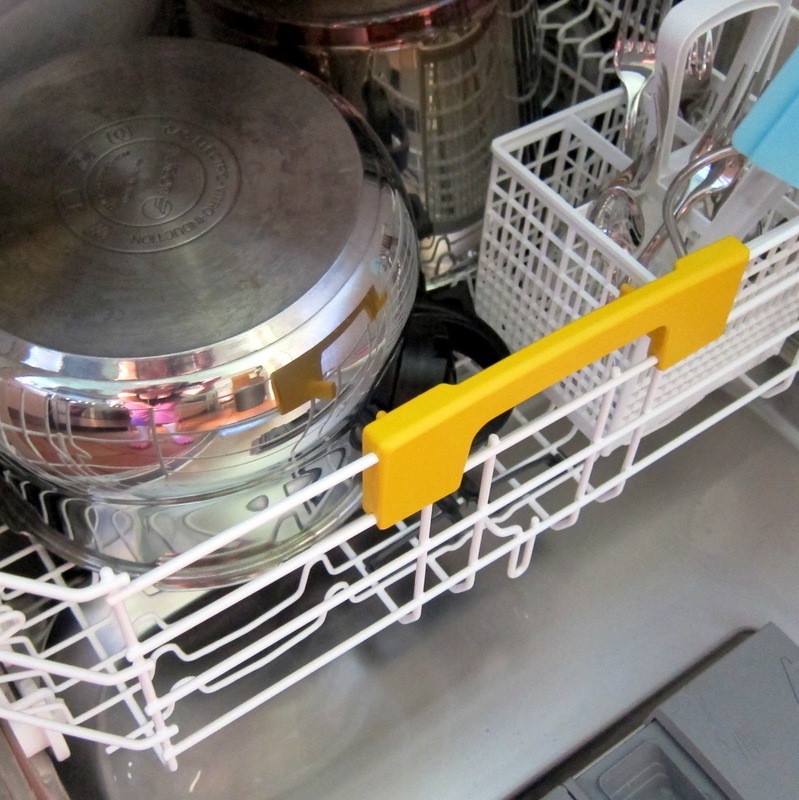 Fagor’s Futuro does alot of things right – but some functionality takes you by surprise -literally! Wide Base – While the opening is standard for a 6L/qt pressure cooker 8.8″ (22.5 cm) at its widest point this pressure cooker is 9.25″ (23.5 cm)! A half inch (1cm) does not sound like much, but when other pressure cookers, like the Fissler Vitavit, have an interior that is narrower than the opening a half inch difference starts to look like 2″ (5 cm)! Short Handles – I prefer pressure cookers with short handles, but the handles on the Futuro look so much alike, that I’m always trying to put the top on the wrong handle – a very small inconvenience for not having a long handle sticking out over a flame of the next burner or sticking out where my kids can reach them easily. Unfortunately, the Fagor Futuro lacks one feature that is standard in most modern – and even first-generation pressure cookers – a maximum fill line. Although expert cooks can eye-ball it someone who is new to pressure cooking might have a difficult time deciding where exactly 2/3 capacity might be, and then half capacity for pressure cooking foamy or foods that expand, like legumes and grains. The Futuro would have gotten 5 out of 5 stars in this category, if there had been a maximum capacity fill line – an important guide to ensure that food particles do not interfere with the operation of the pressure and safety valves. Although the manual lists only three, I have found this pressure cooker to have four safety mechanisms. Primary Over-Pressure Release – Integrated in the pressure release valve, releases pressure in case that it rises above the selected pressure. Secondary Safety Valve– Located under the lid handle, kicks in if the first is not able to reduce excess pressure (in case the first is clogged or the pressure is too high). Self-locking handle – The pressure cooker will lock closed when it begins to reach pressure, and will not allow you to open it until all pressure has been released. Safety vent – in case the first two safety mechanisms should fail, the gasket will buckle and allow pressure (and some of the contents of the pressure cooker) through the metal cut-out in the lid. Always point this little window in the rim away from you while operating the pressure cooker. I have a love-hate relationship with the pressure regulator of the the Fagor Futuro. I love the selection and release, but hate the indicator and regulator. Pressure selection is a snap with big numbers and a lever to choose the needed pressure: 1-Low Pressure (8psi) or 2- High Pressure (15psi). The pressure indicator, a little yellow thing buried in the handle, is too quiet and imprecise. It will pop up when the pan is reaching pressure, not when the selected pressure has been reached. Turning down the heat at the first sight of the yellow signal, as is customary, could mean a loss of pressure. Instead, you are supposed to wait until the valve goes into over-pressure and starts spewing out vapor, before turning the heat down. I’ve taken to touching the raised signal with my finger – if it has “give” or falls back down the pan has not reached pressure. But if it is solid to the touch then the pan has reached pressure. Unlike other pressure cookers tested, the Futuro is so quiet that it will not make a bunch of noise when it has reached over-pressure and it’s time to turn down the heat. Getting this pan up to pressure requires a fair bit of monitoring. Although this valve appears to emit quite a bit more vapor than its peers during operation. The numbers tell a different story. In my tests the Fagor Futuro has an average 3.5% evaporation, the same as the Kuhn Rikon Duromatic. However, the heat required to maintain pressure is higher than the Kuhn Rikon Duromatic (knob position 2.75 vs. 1.6 ) – which makes this pressure cooker grossly less energy efficient than its peers. When pressure cooking is finished, I love this pressure cooker all over again. When it’s time to release pressure, I just need to flick the pressure selector to “release” and a diffused, wide, low-noise cloud shoots straight up into the exhaust fan above my cooktop. Why would such an intuitive function be something I love about this pressure cooker?!? Well, other high-end pressure cookers require you to turn something slowly, or push a button and lever and stand there for two minutes while the pressure cooker de-pressurizes shooting vapor in every possible direction except for where it would make the most sense. Base is dishwasher safe but hand washing is recommended. The valve is really easy to remove for regular, fast cleaning, but there are some nooks and crannies underneath where the system attaches to the pan, that can only be reached by un-screwing the top part of the pressure cooker… and it takes a Ph.D. in Fagor construction to figure out how to put it back correctly. However, depending on the use (and I use this pan alot), you would only be faced with this about once a year (or after a particularly messy experiment). The total weight of the Futuro Pressure cooker base is about half a pound (200g) less than equivalent -sized Fissler Vitavit and Kuhn Rikon Duromatic Pressure cooker bases, and you can really feel the difference when it’s time to clean it. I found the Fagor Futuro stainless steel a little “stickier” than other pressure cookers I have tested so far. This means that you will need to use a little extra elbow grease after pressure cooking a particularly caramellized meal. The Futuro comes standard with a trivet and stainless steel steamer basket. Like the base, the steamer basket is the widest I’ve seen in pressure cookers of equivalent size 8.5″ (21.5cm) vs. the 7.5″ (19 cm) of the Fissler Vitavit. It is nice and deep and has two handles that stay out of the way.Fagor made this steamer basket extra special by capitalizing on the holes that need to be there anyway and turning it into a grater- helpful in a pinch but not ergonomic enough to become your primary grater. Also included is a small recipe book, with color photographs and recipes and a very detailed instruction manual. The Futuro has the best pressure release I have seen, yet. It’s quiet, really automatic (you can walk away while it is releasing pressure instead of pushing a button for two minutes to release pressure), and best of all the vapor goes in the right direction (straight up into my exhaust fan). The shape of the base is the next-best feature. I was able to fit roasts in the Futuro that would have otherwise been cooked diagonally in other pressure cookers. But, unless you have a well-trained ear, it’s a bit of a surprise when it reaches pressure and it needs a bit more heat than its peers to stay there. The Futuro is fun to use and well.accessorized but compared to other premium cookers it’s not the most efficient in terms of energy consumption. NOTE: This review was fact-checked by the Marketing and Communications Manager at Fagor America prior to publication. Have you used this pressure cooker? Add to this review by leaving your comments, below! In the interest of full disclosure, we would like to note that: The pressure cooker was sent to Hip Pressure Cooking by the manufacturer at no cost. Our relationship with the manufacturer, or lack thereof, does not affect the outcome of the review. Thanks for your reply’s, I will try what you have mentioned. In reply to westgl’s post about pressing down on the Fagor lid to make the yellow indicator button pop up: If I think it should have popped up, but it hasn’t, I poke it very gently with a chopstick or something similar. If it was stuck, that frees it up; and if it wasn’t, the amount of “give” tells me whether or not pressure is actually building in the pot. Like Laura, I’d be very cautious about pressing down on the lid. I wonder if my Fagor pressure cooker reaches and stays at the ‘magic’ number of 121.1°C when I keep the heat at MEDIUM when it’s reached pressure? I’m disappointed to see it didn’t make it during your tests. Did your test maintain a continuous or weak flow of steam from the dial – set at “2”? It does appear that keeping the heat a little higher (medium on my stove) will keep the temperature inside a little higher. I do NOT mean triggering the safety devices to release over-pressure; instead I refer to maintaining a constant flow of steam from the dial. I know that having the heat too high wastes energy and results in forceful and very loud steam gushing from the dial (which also risks boiling dry). The manual says the user must maintain a flow of steam throughout the pressure-cooking time. The pressure is 1.05 bar – not 1 bar. The extra .05 bar means the equivalent psi pressure should be 15.2 psi, not 14.5 psi. The heat setting to stay at pressure seems to make a difference. If the heat has been set too low (and the steam flow weak or quiet) this has slightly undercooked my veggies. I have since learned that keeping the heat at medium (3 out of 6 – not even 2.5 out of 6) is perfect – as per advice in the instruction manual to maintain “a steady, continuous flow of steam”. I have uploaded a photo of the relevant page, showing the pressure levels and the cooking advice I’m referring to. I know I uploaded the same image previously, but this time I’m hoping it will be sharper and clearer than the previous one. My first response was hasty. Let me tell you a bit about how the test is done – and how I have standardized it between cookers. 1. I fill the cooker to cover the monitor for about 1″ with water – I am not measuring time to pressure for this test so the quantity does not need to be standard. 2. The remote logging monitor is suspended in a sling fashioned from a steamer basket and held by cotton string – this ensures that we get the temperature of the liquid, and not the stainless steel that is in contact with the flame. 3. I bring the un-covered cooker to a rolling boil and hold it there for 10 minutes to calibrate the logger to 100C – this is not required by the logger manufacturer. It is a step I prefer to do to ensure the readings are accurate. 4. I lock on the lid, turn up the heat and bring the cooker to high pressure. I use the signals the cooker’s own manufacturer says to judge whether it has reached pressure – not what I think it should do. So, if the Fagor manual said to wait for the yellow button to come up and thin stream of vapor coming out of the valve means it has reached pressure, I wait for the cooker to behave that way before I turn down the heat. 5. I time 10 minutes at high pressure, making any adjustments as necessary to maintain pressure. 6. When time is up I open the cooker, remove the logger and cool it in a bowl of cold water, dry it and finally plug it into my computer to stop the logging and download the data. I hope this answers your question – of the cookers I have measured so far almost none have reached the temperature / pressure they claim to operate (cook) – some run a little hotter (WMF) and some a little lower (Magefesa -coming up). Seven months on, I have found what appears to be the “foolproof” method, which avoids unnecessary loss of liquid and excessive venting of steam through the dial (when set at 1 or 2). I bring my Fagor to pressure using high heat, until steam flows from the dial, followed by a “hiss” and continuous flowing steam. Now I turn off the heat for about 30 seconds or until the steam flows very gently. At this point – instead of using medium heat, I use a low heat to keep the steam barely venting from the dial. If the pressure cooker goes completely silent, it means the heat is set too low, so you only want it barely venting – but continuously – for the cooking time of your recipe. Nothing has been undercooked so far. The secret is to make sure your chopped ingredients e.g. potatoes have been cut to the right size (I was cutting them too big for a long time!). At first you may get a drip of water from the handle, after the steam flows from the dial at the beginning (it’s caused by condensation on the cold lid to start with). The drip of water will stop completely when the steam barely vents from the dial. I hope this helps other owners of Fagor stovetop pressure cookers. About six months ago, I purchased the 10qt Futuro along with a Max Burton 1800 and couldn’t be happier. The combo screams! First, it makes all that high school chemistry and physics come to life. Then it sits on the other end of the counter next to the coffee maker. They are a day’s bookends. It gets loaded and after coming to pressure, is left on the timer, out of the way from the rest of the stovetop prep. Even as a novice, I’ve come to recognize and respond to some of the quirks in the review. However, I’m also not too particular about some of those things. My culinary school was a campfire and a boy scout patrol. I cooked everything with the stove burners on HIGH until one of my college room mates mentioned the other nine settings on the dial. It has really earned its keep precooking beans, making stocks, and precooking smoked pork parts. Hours of time cooking bean soups are now compressed into twenty minute prep episodes followed by a thirty to forty minute combined finish. Plus, the meat portion can be boned after precook prep. I haven’t had the scorching problem usually mentioned with induction cooking. It was easy to avoid. Sauces that might scorch are in a separate, loosely covered, SS bowl sitting on a one inch high trivet over two cups of water. That staining problem? Soak over night filled with citric acid solution. Comes out shining. Time to stop tattling on. 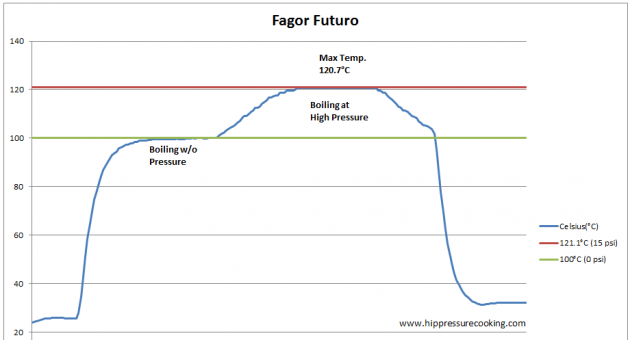 Hi, I wanted to know the differences in features between the Fagor Futuro and the Fagor chef. Also which one is easier to use and also performance wise which one is better. Also any problems with either model. Well, I don’t have a Fagor Chef so I can’t really give you a fair comparison. If someone has both of these cookers please feel free to comment and share! – The Chef has a cute little removable timer with a magnetic back. You can either put it back in the cooker when you’re cooking or stick it on your range hood. Thank you for your prompt reply. I will wait and see if anyone else has had experience with the Fagor Chef, since your information about the Futuro are quite comprehensive. Thank you for the information about Fagor Chef. I was looking at the features of the Chef as well as the new Cayenne model on the Fsgor website. I would like some advice regarding which one of these models, as well as the Futuro, has the best features, and is most user friendly? Thanks for the touching yellow button tip to check for pressure. Takes some of the guesswork out for a newcomer to pressure cooking. Some of the cooking times in the manual seem a bit odd. I cooked potatoes after the water test and they weren’t cooked at the recommended 6 minutes. 10 minutes and they were good. The manual said 1 1/2 inch slices, but mine were closer to an inch, so should have cooked faster? The real oddity is that broccoli is 8 minutes in the English section and 2-3 in the French and Spanish sections. I cooked broccoli for 2 minutes in my IPS and it was pretty darned cooked. So far I am pretty impressed though. Very shiny, very elegant, and seems to work well on my old cheap induction cooktop. My 6L Futuro works well. Overall it is wonderful. I was a bit taken aback that the Steamer/grater has rust spots after two uses though and it is supposed to be 18/10 stainless. I have emailed them but no reply. I’ve also emailed asking about the dessert accessory set you have a link for and they replied within minutes that they no longer manufacture them. Too bad. Well, in the right conditions even stainless steel can rust! I don’t know if the basket is 18/10 – I haven’t seen where they claim it. However, sometimes it’s just left-over food particles, other times it can be what we use to clean them. Don’t ever use bleach on stainless steel – except for an exceptional clean-up job that an overnight soak did not cure and then: VERY briefly. They claim it on their store where they sell the basket separately. Is definitely rust and I have only rinsed it. and there is no visible seam where the rust is. It is where the bottom joins the sides. Just received email and they say they will mail me one. Great service. To those of you who had questions about the Fagor Chef – their newest premium pressure cooker model. Come to ask me any questions you have about the Chef pressure cooker in the comments section there. More Pressure Cooker Manuals & Booklets!